In December 2017 the Centre for Non-Traditional Security Studies at the S. Rajaratnam School of International Studies (RSIS) identified four policy balances that must be struck when using emerging technologies in humanitarian operations. 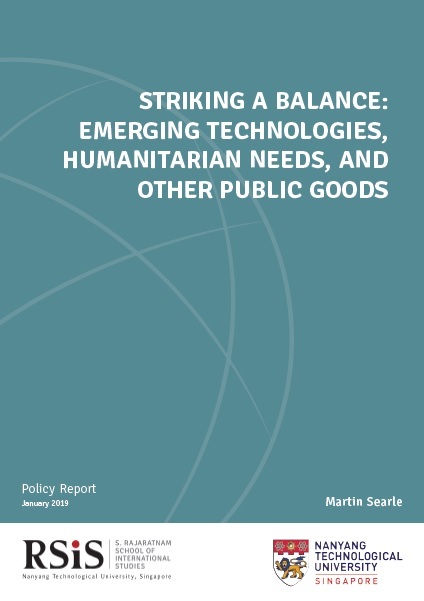 This report specifically explores how to balance humanitarian uses of emerging technologies and other public goods. It presents two principal findings. First, inhabitants of less regulated, often less developed locations, shoulder a greater burden of the risk from experimenting with emerging technologies for humanitarian use. Second, humanitarians’ regulation of their own innovation efforts may produce sub-optimal, even perverse, results. The paper gives several policy recommendations in light of these findings.